Regarded as the patroness of couture, Madame Grès felt she was predestined to become a sculptor. Yet when fate steered her towards the fine art of the draped dress, the designer gave shape to her tactile ambitions by practising an alternative discipline. Treating fabric as she would stone, Madame Grès, née Germaine Krebs, carved out a place for herself in the chronicles of fashion with her clean, modern lines and precise expertise in seamless draping and pleating, which is still being referenced by numerous designers today, from Alaïa to Ackermann. Madame Grès: Sculptural Fashion is Anwerp’s MoMu's recomposition of the 2011 Madame Grès exhibition staged in the Parisian sculpture museum, musée Bourdelle. Presenting an overview of the designer’s 50-year career by showing her work in original editorial images taken by the greatest photographers at the time and a number of Grès’ own original drawings, the exhibition subtly emphasizes Grès’ timeless modernity by juxtaposing her silhouettes with those of contemporary designers. Without the traditional sculpture backdrop of the Bourdelle space, the Antwerp set-up is conceptually different from the original curation by Olivier Saillard, as it receives an injection of a more abstract monumentality, courtesy of Brussels sculptor Renato Nicolodi. Prior to the opening of the exhibition, Karen Van Godsenhoven, co-curator of the Fashion Museum, gave AnOther a guided tour through the developing space. Was it initially planned to take on this exhibition after its installment at Bourdelle? No, not at all. We visited the exhibition in Paris first, and talked about taking it to Anwerp only afterwards. Previously, the MoMu has focused primarily on Belgian designers and avant-garde, so this was a chance for us to offer our audience a more classical, haute-couture exhibition. It’s more approachable in that sense, though it’s still not a popular subject that hinges on the glamour of the kind of haute-couture with sequins or decoration. The arresting characteristic of Grès’ oeuvre lies in the perfection of her craft. "The arresting characteristic of Grès’ oeuvre lies in the perfection of her craft"
How does the Antwerp set-up differ from the Parisian one? There were some pieces and silhouettes which were too fragile to be moved. We’ve replaced these with new silhouettes kindly lent to us from private collectors. Hamish Bowles, for example, contributed about 30 dresses. He kept on finding ones for us to use! In terms of concept there are huge differences. Bourdelle is a museum dedictated to sculpture, which means their space is fitted out for displaying pieces of monumental calibre. 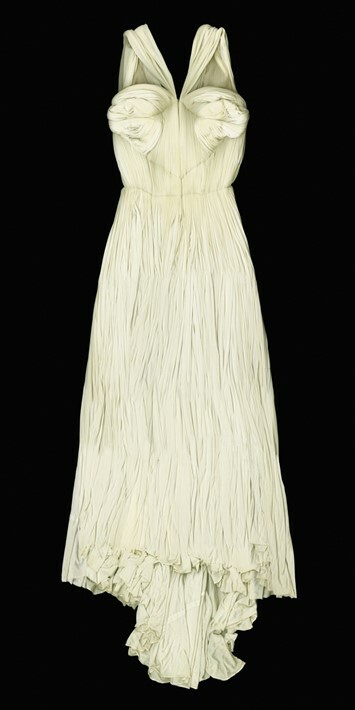 MoMu had to find a way to do justice to the sculptural qualities of Grès’ gowns. In addition to our in-house scenographist Bob Verhelst, we took on the young sculptor Renato Nicolodi. He’s an up-and-coming Brussels artist whose work is based on classical architectural forms that are abstract and familiar at the same time, harking back to archetypical styles that can be retraced as far back as Mayan architecture. What’s the relevance of Grès today? What I find so great about this exhibition is that it has no external reason for existence. Just like Grès herself, in her own time, the fact that the exhibition runs now has nothing to do with a current trend, or a resurrection of the house, or any other occasion that gives it momentum. Grès abhorred trends and very firmly placed herself outside of the fashions that were popular during her career. Christian Dior’s New Look or Gabrielle Chanel’s modern cuts were a world of difference compared to Grès classical sources of inspiration and intense methods of working. She never sewed, or cut patterns, but instead draped directly on the body, creating seamless designs. These techniques of ‘moulage’ and ‘drapage’, so I’ve heard from teachers here at the Academy in Antwerp, are regaining popularity. A 2012 graduate, Marius Janusauskas, even based his Master collection ‘Sleeping Beauties’ on Madames Grès. As a testimony to Grès’ relevance in contemporary fashion, the designers Haider Ackermann, Yohji Yamamoto and Jean-Paul Gaultier each have selected sihouettes of their own design that reveal the influence of Grès' vision of fashion on their work. We’ve also blended contemporary pieces from Lanvin and A. F. Vandevorst amongst the historic Grès pieces. We wanted to arouse that feeling of suprise in the viewer when they read the booklet and then realize how great the consistency is between the Grès pieces ranging from the ‘30s to the ‘80s, and pieces which are the result of her aesthetic on fashion today. Do you have a favourite silhouette? The final dress Madame Grès designed is my favorite. Even after her bancruptcy, Grès continued to work, claiming it would be the end of her if she quit designing. The pieces she made at that time, she gave away, and this particular one was a gift to Hubert de Givenchy. It’s a Japanese-inspired dress – kind of a Watanabe precursor – that plays with volume and has a busy floral print. It’s very different from her earlier style, but a striking example of Grès’ modernity proven by the dress’ subtle cultural references while maintaining a timeless air. Madame Grès: Sculptural Fashion is at MoMu, Fashion Museum Antwerp, until October 10.